How's everyone doing today? Did you enjoy your St. Patty's celebrations? 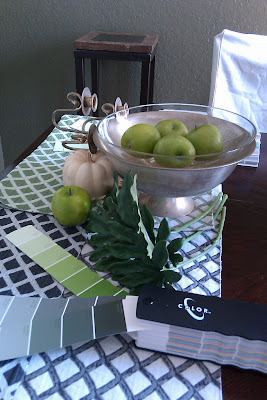 Although I may not have posted anything green on the blog, I was well into it. 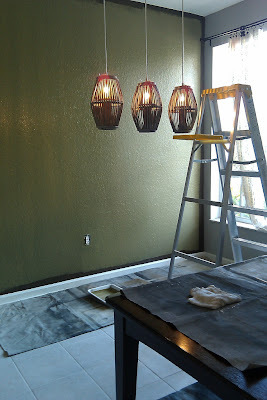 As part of the Spring Cleaning I've been doing around our home, I was wanting to refresh the dining from a deep, dark (almost depressing) chocolate brown from fall / winter to a happy spring green. I remembered we had a can of OOPS! mossy green paint in the garage, so I decided to try it out in our dining space. Remember - It's just paint. You don't like it? You can change it. There's a reason why OOPS! paint is in the OOPS! pile. 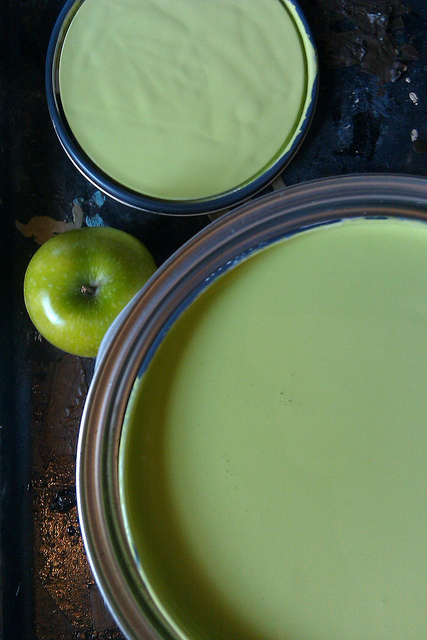 Although I had spotted this oops mossy-green paint back in '04 - I never felt inspired to use it (it seemed too dark). 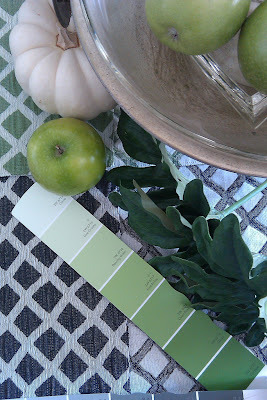 Since I was wanting to refresh our dining space for Spring, I thought this would be a great chance to use it. It was a little darker than I'd like, but I thought the sunlit space would brighten it plus I could lighten it with white... and then with cream... but as I did it became even more of an oops!! (I think it needed more saturation and life - probably I needed yellow to lighten & brighten it). 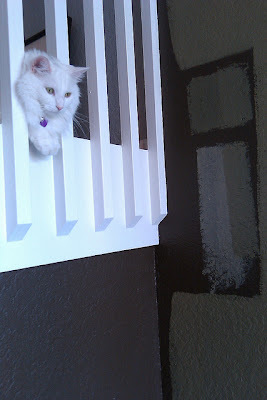 My paint supervisor - Sephora. On trend yes - But no likey for now. 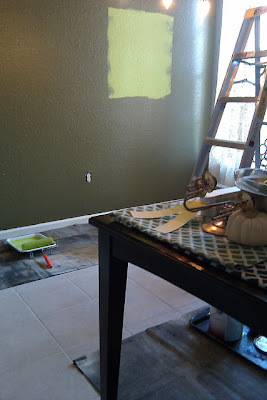 Rather than get upset over the effort, I thought ok - I'll consider this the primer to cover the RL Crosby brown and I set out to a nearby Sherwin Williams to pick up a more cheerful shade of green - and FIX MY OOPS! 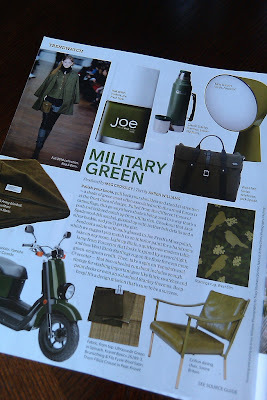 Even though Military Green is on trend (featured in House & Home) - I wasn't "feeling" it in our space. Living room (background) already refreshed with green, black & white. 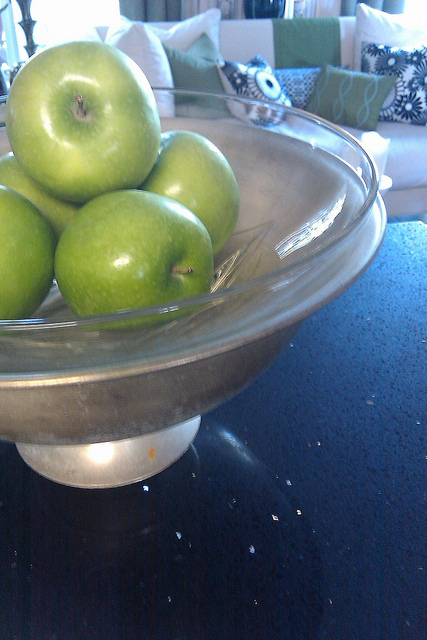 Apples in the kitchen for a pop of green. 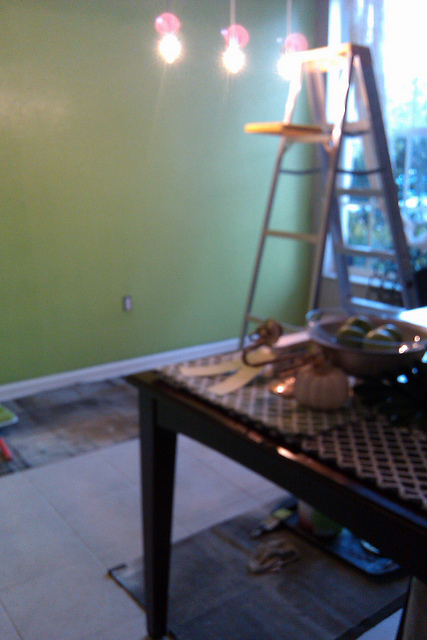 Moss green already on wall - but not a happy feeling in space. Patterns on tables are from two fabrics from free samples my friend Jose gave to me I really wanted to use them in the space (but that's another post). I went with the happy medium - Lime Ricky. I'll reveal some shots of the refreshed space shortly... Right now I'm on my way out to make a donation drop off to Goodwill... Hmmm.... I wonder what I might find there? Stay tuned!! Lime Ricky makes me sing! It was a risky, but it's just paint! And I'm really loving the fresh look! 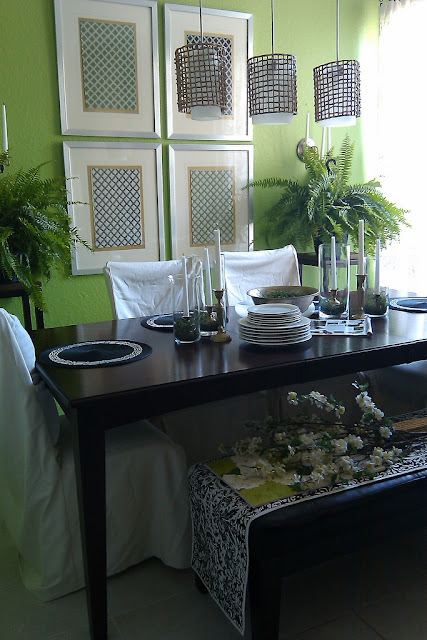 some refreshing Spring tablescapes for Easter! Looks like your dining room is going to turn into a fun place for entertaining. Looking forward to seeing how it turned out. I'm loving that military green color! I bet the room will turn out very lovely! 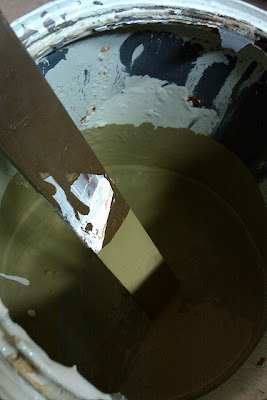 How exciting, just whipping out paint for Spring. 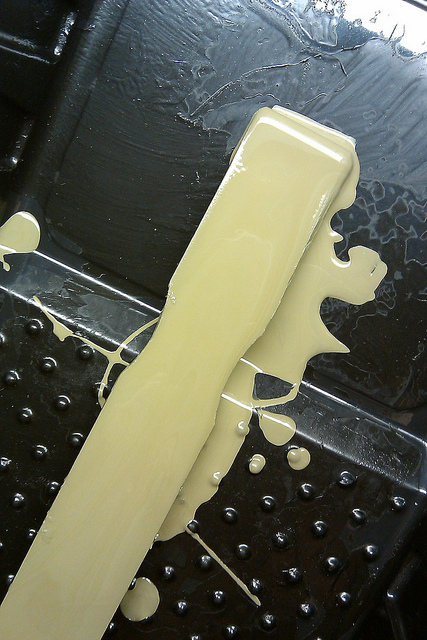 I've checked out the oops paint but never any good ones! Can't wait to see your finished green! rrright Becky??? 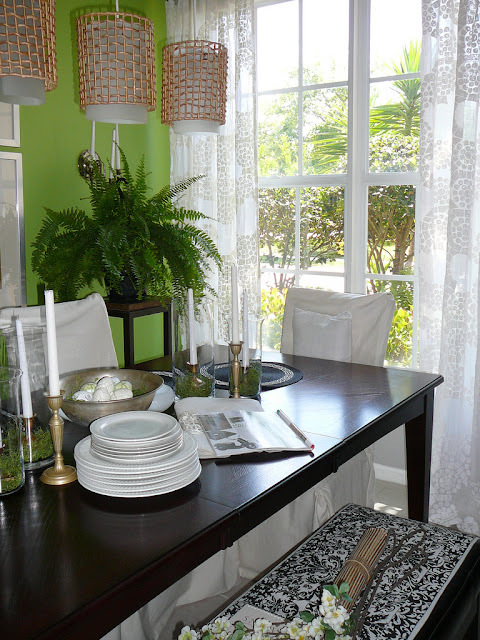 It's especially bright & cheerful when the sun is lighting the space naturally! I just made a slip cover for the bench too so will be posting pics shortly. Thanks for stopping by an taking the time to comment!! Yup, love the Lime Ricky green. I totally hear you on the "oops" paint. I sold 5 cans of "oops" I had at a garage sale recently. Mind you I lugged it all from my old garage when we moved to this house, thinking I would surely use it! But the colors were never right. 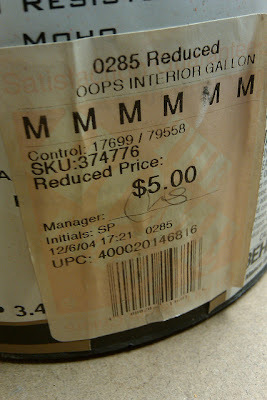 Then last week Home Depot had their FreshAire line closing out at 5.00 gallon. I bought 3 gallons of that, had one mixed for my daughter's room, but she hates it! So now I am back to gallons of "oops" in my garage that I propbably wont use...when will I learn?! Lol! 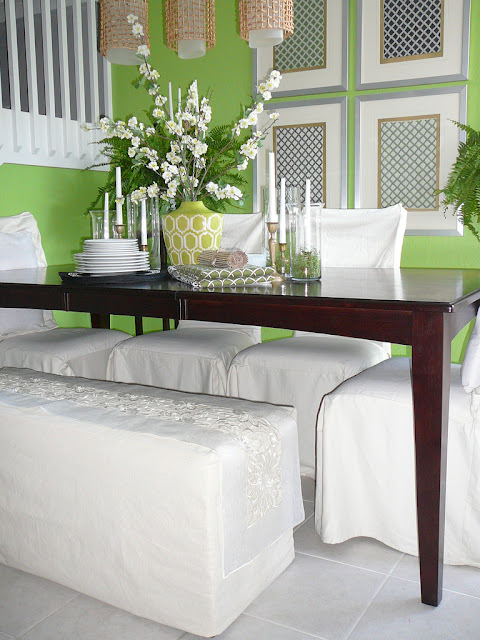 Your diningrooms looks great. I am always so afraid to try to just paint a color on my wall, as you say you can always just paint over it, but I freeze in fear. Guess I'll just have to get over it now and get to painting. GOODWILL IS PUMPED FOR SPRING! SEE MR. GOODWILL HUNTING ON NATE! CHECK OUT KELLY HOPPEN'S NEW BOOK! What's going around? Spring Cleaning Fever! Have you had your 'style diagnostic' done yet?